Barrel Oak Winery is all about dogs and quality wine. First established in Delaplane, VA in 2008, Barrel Oak Winery, or BOW as people affectionately call it, have been serving both people and dogs (sorry, dogs are always underage). They serve many varieties of wine, like Chardonnay, Viognier, Merlot, Cabernet Sauvignon, Vidal Blanc, and amazing award-winning beer from their new Farm Craft Brewery, to their customers while they can watch their dogs make friends and run around. They hold various events that are donated to animal shelters and rescues and have plenty of dog treats for your canine pals, as well as a lot of room for them to run. If you plan on finding a place to bring your dog to, there’s no better place than BOW. Stone Tower Winery is a large farm located in Leesburg, VA, with over 75 acres of vineyards. Having bought the property in 2005, they host a variety of different wine like Sauvignon Blanc, Pinot Noir, Petit Verdot, Marsanne, Nebbiolo, and others. With over 200 acres of land to run around in, people can take their dogs on a walk as long as they hold a leash. Not only that, but this dog friendly winery in Northern VA have pet friendly indoor tasting rooms, allowing you to sit down with a glass of wine while petting your cute pup. For those who would love a big area for your dog to run around in while sipping a cup of wine, Stone Tower Winery is the place for you! Three Fox Vineyard got its name when one of the owners saw three foxes on a hill on the vineyard property and it snowballed from there. Opened in 2002 in Delaplane, VA, the main wines that they sell are Italian varieties, like Sangiovese, Nebbiolo, and Pinot Grigio, as well as a few French wines like Viognier. Not only does Three Fox Vineyard allow dogs, they also allow cats onto the property. They also choose a dog and a cat of the month, the winners getting a bandana for their pet, 10% off wine purchases, and a reserved table for the owners and their pets for that entire month. Want to bring a pet over and win prizes? Then come to Three Fox Vineyard, one of the top dog friendly wineries in Northern VA! Breaux Vineyards is well known for their great tasting wine and their love for dogs. Opened in 1997 in Purcellville, VA, Breaux Vineyards has been, at one point, voted for Virginia’s favorite winery. All the fruit used for the wines are handpicked and gently aged, giving them a distinct flavor. Some wines they have include red wines like Barbera, Malbec, and Chambourcin, and white wines like Muscat Orange, Seyval Blanc, and Semillon. 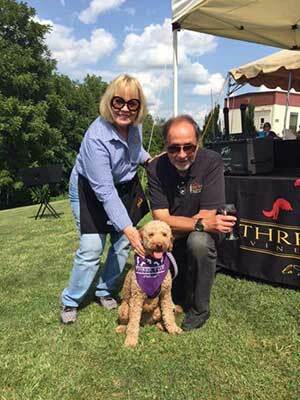 This dog friendly winery in Northern VA holds an annual Dog Day for dog owners, where they have various contests like largest dog, smallest dog, and coolest trick, treats for the dogs, and prizes to win. Want to see this annual Dog Day? Don’t miss out on it by heading to Breaux Vineyards! Keswick Vineyards was established in the year 2000 in Keswick, VA and has won various awards from that time on, such as “Best White Wine in America” in 2002 and the Virginia Governor’s Cup in 2009 and 2014. Some of the wines they sell are hard to find in other wineries, such as Nektar, Amélie Rosé, and Touriga. Keswick Vineyards acts as both a winery and a off-leash dog park, allowing your canine pals to run around and have a great time exploring the estate. They also host a “Yappy Hour,” every Sunday afternoon for dogs, allowing them to mingle and socialize. 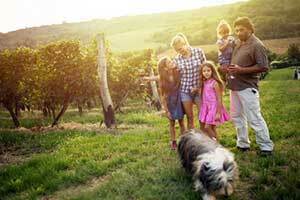 Interested in an off-leash dog park and winery? Then Keswick Vineyards is for you! Maggie Malick Wine Caves, located near Harpers Ferry National Historical Park, is known for their award winning wines and their fun and dog-friendly atmosphere. Maggie and her husband Mark purchased the land in 2001, that was once a Christmas tree farm, and decided to repurpose the land and plant 5 acres of grapes. This eventually led to over 30 acres, and 15 grape varieties currently in place today. 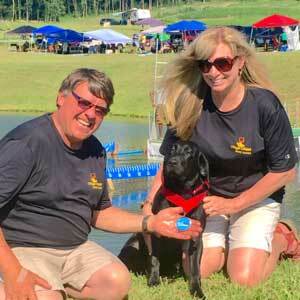 In May 2018, Maggie’s vineyards will be hosting their first DockDog event. This event will host dogs from all over to compete in a jumping competition off their 40-foot dock into the pond located at the vineyard. Additional events have been planned for the summer of 2018, and details can be found on their website. If you are interested in a fun and dog friendly atmosphere, and don’t mind relaxing with award winning wine, then Maggie Malick Wine Caves is the place to be!